Did you know that one third of Facebook fans like a Facebook page so they can participate in contests? And you gotta give the people what they want, right? If you’ve decided to run a Facebook contest (just like your Fans want you to) then you’re going to need to make it as awesome as it can be. Plus, you want to get as much out of it as you can, right? With these contest best practices, you will make the most out of your Facebook contest campaign and overall strategy. #1: Decide on your contest’s goals. What do you want to gain by running a Facebook contest? This is imperative to deciding which type of contest you’re going to run, as they all have different end goals. All of Wishpond’s contests will help you gather leads, but some types of contests are better for getting user-generated content (UGC), brand awareness, etc. 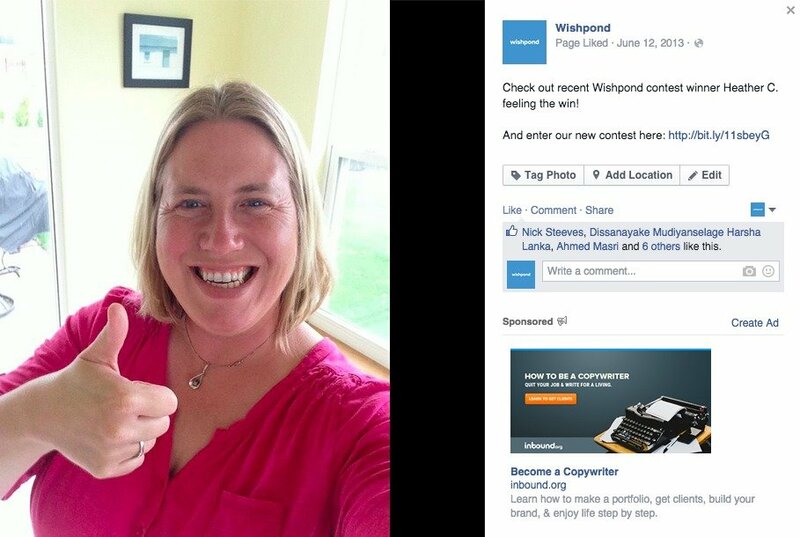 #2: If you don’t have 1,000+ likes on your Facebook Page, start by running a sweepstakes. This rule applies to Facebook Pages with low engagement also. Sweepstakes will ramp up the engagement on your page (as long as you follow the best practices in this article!). #3: Get contestants to bond with your brand. Get them personally involved with the contest to create more excitement. For example, have them design a limited-edition product for you for a chance for it to get reproduced. #4: Give away a prize relevant to your business. Make the contest prize something that a wide variety of your customers/clients will like. A gift card/certificate is always a good go-to prize for a contest. #5: Use a popup like box to get more likes for your page. 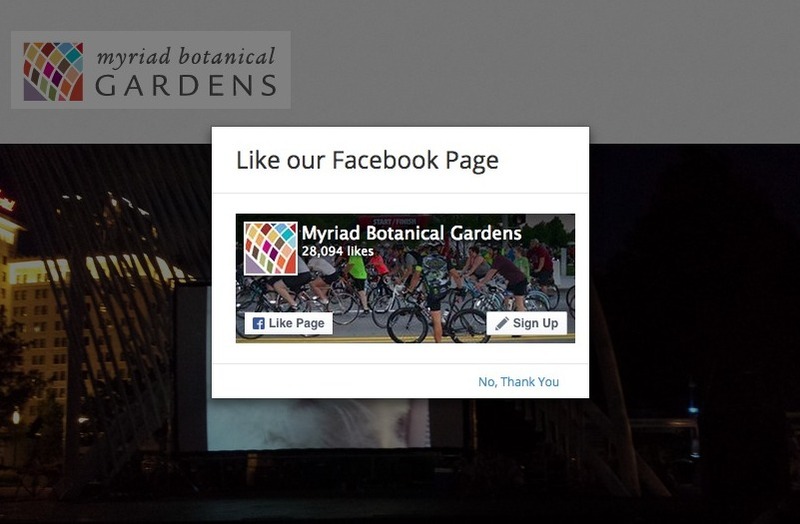 Popup like boxes will increase your followers, as it prompts users to like your Facebook page before they enter. They have the option to say “No, Thank You” if they like. #6: Promote your Facebook contest on all of your active social networks. Take advantage of all the social networks your business is active on (Facebook, Twitter, Google+, Pinterest, etc.) and promote your contest on those sites. There are dozens of websites that showcase contests for contest fanatics to enter. These websites are great ways to expand the reach of a contest, especially if you have a new business or you’re just getting started with Facebook contests. These sites work particularly well for posting easy-entry type contests such as a sweepstakes. #8: Don’t let your contest run too long. #9: Have a succinct headline. Wrap up your headline in as few words as possible. Make sure to mention what’s in it for your fans - ideally with the dollar amount your prize is worth and action words (like “enter to win” or “win a [your product/service] today!”). #10: Include specifics and guidelines about the contest. Think about your contest’s process. For example, consider how a winner will be chosen. By thinking about the process of entry through to the end of the contest will help to eliminate some room for error - being clear about the contest rules prevents confusion and chaos. #11: Choose a third party app to run your contest. Third-party apps make running a contest a hundred times easier, faster, and more successful. Our contest apps literally take 5 minutes to set up - and one of the best parts is that you don’t have to worry about Wishpond’s contests going against Facebook’s Page Guidelines - they’re already approved. #12: Keep your entry form’s length short. By having too many form fields on your entry form you can scare away tons of potential entrants. Try to keep your Facebook contest’s form fields down to five or less. Have less form fields for contests that are easier to enter. This is similar to keeping your form fields down to a minimum - you don’t want to overcomplicate the entry process and in turn lose potential entrants. Don’t have your contest’s participants jump through hoops in order to enter your Facebook contest, keep the entry process to 5 steps or less. #14: Time it with a holiday or event. Like a trending hashtag on Twitter, being timely will help you get more Facebook contest entrants - as a lot of people get excited about holidays and popular events and some will in-turn get excited about your contest. #15: Make sure your contest is optimized for mobile. Did you know that 50% of contest participants are entering through mobile? With wishpond you don’t have to worry, our contests are automatically optimized for mobile. #16: Be clear about user-generated content (UGC) use. Good promotions generate UGC for their business. If you are planning to use entrant’s content, be sure to specify that you’ll be using their photo, review, etc. of your business on social or for promotional use. I recommend just saying you’ll share it with followers and web visitors to avoid people thinking that you’re going to use their content to make money off of it. If possible, run a contest once a month. This will create anticipation around recurring contests and will give your Facebook fans a solid reason to keep returning to your page. #18: Find a contest sponsor. Or a “contest wingman” as Rachel of MadeFreshly so happens to call it. This will give you more reach for your contest - you’ll have 2 Facebook Pages and potentially other resources, such as offline promotion such as in-store signage, radio or TV. Rachel details more of the process here. #19: Email the contest winner. There are a few good reasons as to why this is a best practice - but mainly to make sure the winner is eligible and to have the person respond to claim their prize. #20: Get the contest winner to send you a selfie of the win. Alternatively, take the photo (or video) in person if you’re a local biz. make sure to get their permission to post it though! This is also good to gain the trust of your facebook users so they know someone actually received a prize. #21: Email your entrants with a consolation prize. I’m not talking about giving away something big, just a little something little to show your appreciation for participating (and can potentially turn facebook fans into customers)! I don’t see clients implementing this strategy enough. Now that you have all the top tips and best practices for running a Facebook contest, it’s time to get started on your next contest! Let me know if you see better results with any of the Facebook Contest best practices I’ve provided above.